Blitz Bowl is a new Boxed Game from Games Workshop that is available in Barnes & Noble. We got our hands on a copy and are taking a look inside the box – what’s new and what’s different about this game vs Blood Bowl? Let’s find out! 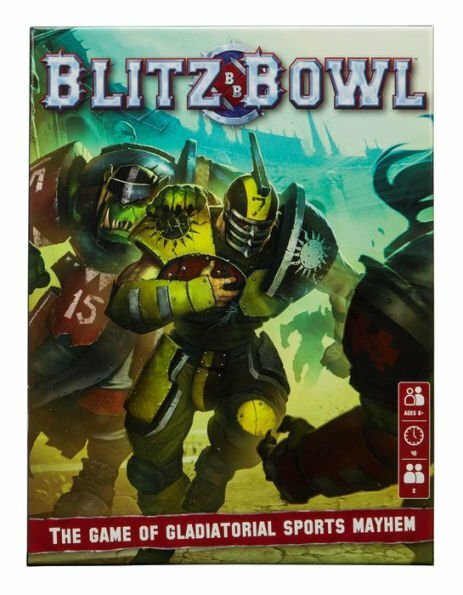 If you’ve ever played Blood Bowl and thought, “Gee, I kind of wish the field was a little shorter and there were fewer players on the field, but the action should be just as fast and furious” well then that’s pretty much Blitz Bowl in a nutshell. Blitz Bowl is still a game designed for 2 players but it plays in about 40 minutes (once you get comfortable with the rules). Inside the box, you’ll find everything you need to start playing. It comes with two teams of 6 players (an Ork Team and a Human Team) and each team is in colored plastic. You’ll also get the new double-sided Blitz Bowl Board, dice, 2 dugouts, balls, a range-finder, and of course the rulebook. Also included are stat cards for all the players as well as cards and rules for some of the OTHER teams from Blood Bowl (specifically the Elves, Goblins, Chaos, and Dwarf teams). That’s right – the contents in the box do support other teams from Blood Bowl so it’s “sort of” compatible or expandable depending on how you look at the game. The box also includes 40 challenge cards as well as 7 drill cards. The Drill cards are used to help you learn the basics and the challenge cards can be used to add some in game effects. Blitz Bowl is interesting because it seems like it’s geared toward new players or younger players (it has an 8+ age logo). At the same time, it changes up some of the extras of the game of Blood Bowl but keeps a lot of the core game play. If you know how to play Blood Bowl you’re 95% of the way to knowing how to play Blitz Bowl. 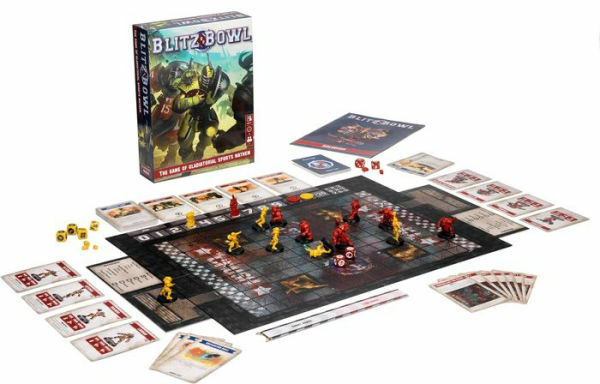 If you’re a parent who wants to teach their kids to play or if you’re just looking to try a slightly different take on Blood Bowl, then give Blitz Bowl a go. Welcome Sports Fans! Blitz Bowl is a fast-paced sports game that pits two teams against each other in a battle to achieve touchdowns, complete Challenges and score the most points, through a mixture of skill, luck and aggression! The teams are smaller, the games are faster but the action is just as intense, as each player seeks to distinguish themselves in the eyes of Nuffle in the infamous Crush recruitment rituals. 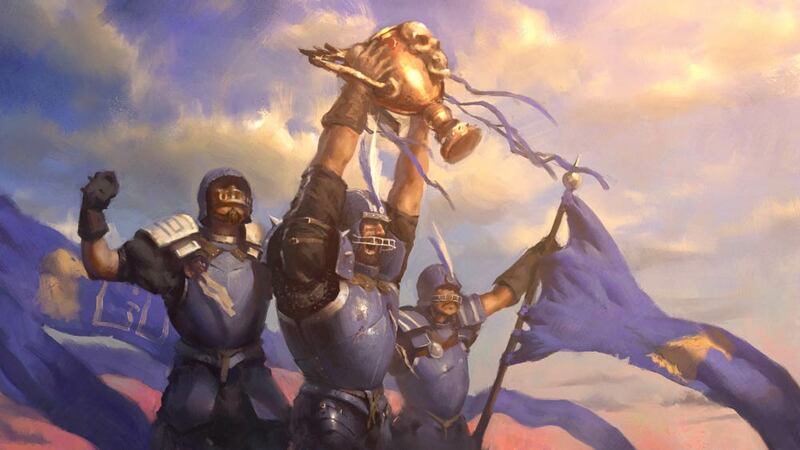 The game features a number of elements that will be familiar to fans of Blood Bowl, meaning that the two games are ideal companions to each other. Players should expect to complete a game of Blitz Bowl within an hour and considerably less once they have a good grasp of the rules, making for a thrilling quick-play experience. Don’t forget to mop-up the blood on the pitch before the next game!